Using a PIC12F675, up to 5 outputs can be switched sequentially using a standard Remote Control pulse input of between 1 to 2 ms. Although any RC channel input can be used, it is especially useful when used with the rotary knob channels (usually 5 and above on RC airplane remote). The knob can be rotated to a certain position, selecting which output relay will be turned on. The example circuit shown below switches between 3 inputs to 1 output. Many different configurations could be created for specific applications. A larger PIC could be used for more switching outputs. This is a useful circuit for Pulse Width Modulation of a load using a standard Remote Control pulse input of between 1 to 2 ms. 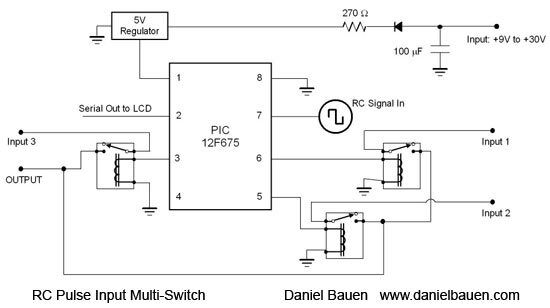 The circuit can be used as a simple motor speed controller, or to control the brightness of a light, or other loads that need a variable voltage. The PIC12F683 is ideal for this purpose, because it is a small microcontroller, that has a hardware pulse width modulation channel (HPWM). This means that the PWM signal runs in the background while the microcontroller processes the rest of the code. So the PWM output is not dependent on the length of time it takes to execute a program loop.